One of the best things about having a local patch to watch wildlife is that however often you go there, the experience will never be the same. And if (for whatever reason) a couple of months have come and gone since your last visit, the patch will welcome you back like an old friend with open arms. And you, in return, might be quietly astonished just how much the patch has changed during the interim. Churston Woods is our local patch. We don't go there every week and tend to go through stages of being lured away to different locations in Devon to see what we can find. But as the saying goes, it's always good to come home and by revisiting the same places, you learn what to look for and begin to observe patterns emerging. From home, we walked to Churston Cove, where the Lady enjoyed a brief swim and made our way up through the woods. Just outside Brixham, on an Ordnance Survey Map, this area is called The Grove but we've always called it Churston Woods and I don't suppose we'll ever call it anything else. 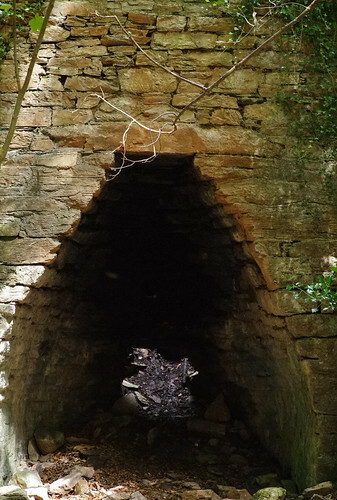 In the past, limestone and coal would have been burnt in this kiln to produce quicklime and spread on the nearby fields as a fertiliser. Today, the woodland is a nature reserve managed by Torbay Coast and Countryside Trust. We followed the main path in the wooded valley, which then led uphill to the top and the boundary of the wood on one side. From there, we took a left along a path which led to the wild meadow. The last time we were here, the meadow was wild with ash saplings and tangles of brambles. Since then everything has been machine-cut and the jagged, stubby roots are a sorry reminder of their former glory. From afar, our first response was "where has it all gone?" The wild place we loved had been decimated and replaced with a wilderness of bare ground. I wouldn't like to hazard a guess at this stage which crucifer this might be. The best determiner will be to return and examine the size and shape of the pods on the plant later. 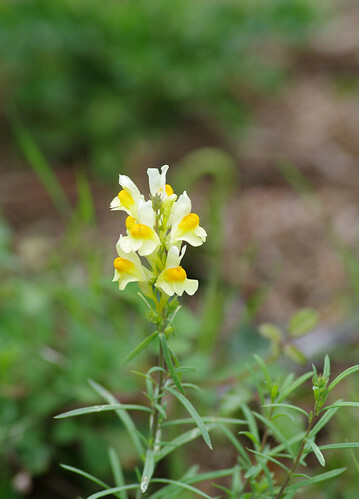 No such dilemmas with this distinctive and colourful yellow toadflax flower. 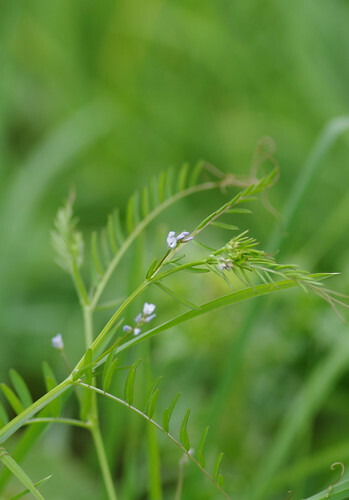 because the flowers were small and pale and there were many pairs of leaflets. After admiring the diversity of the flora, we turned our attention to the hedgerows. There were strange sounds coming from the Annual Steam Fair less than a mile away. The hollowed sounds the engines made sounded oddly like pan pipes and the barrel organ pumped out carnival tunes. At one point, it sounded like a bizarre rendition of Britney Spears' (You Drive Me) Crazy as sung by The Wurzels. 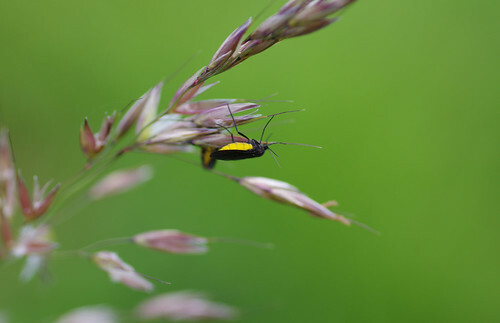 We found these yellow and black beetles on grasses but could not find them anywhere in the field guide. Dingy Footman (Eilema griseola). This moth is the stramineola form. 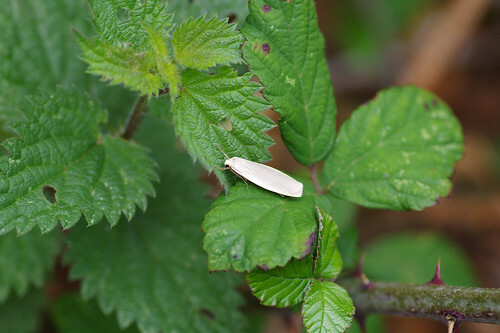 If moths were aware of the names they had been given, the Dingy Footman would have definite cause for complaint. Although this moth was bowing down, as the footman part suggests, to call it dingy seems grossly unfair. I would have missed it altogether, tricked into thinking it a discarded seed, had I not detected its antennae - less than a hair's breadth but twitching on a leaf. 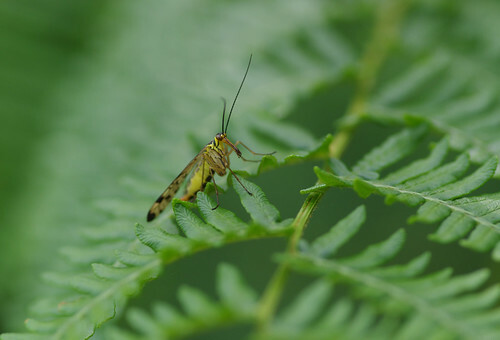 Hedgerows are a bountiful place to find all manner of weird and wonderful insects, including this Scorpion Fly and we paused many times on both sides as we continued our walk along the track many locals call "the Old American Road." 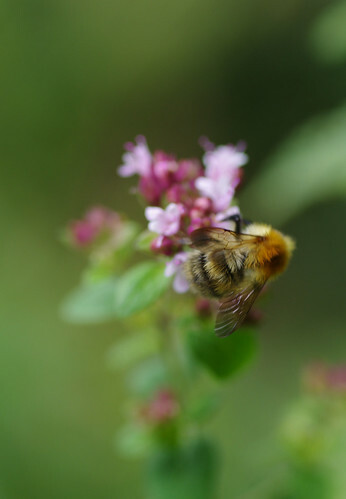 Sherry was photographing Wild Thyme when this Bumble-bee landed on the flowers and obligingly did a little wriggling dance. The second photo has been included to capture the sense of movement. Although the bee is not at the centre of focus, I think the stripes on the back came out very clearly and the flower's been nicely rendered, too! Several times every year, I walk along the same stretch of path, wondering when the broomrapes will be making an appearance. 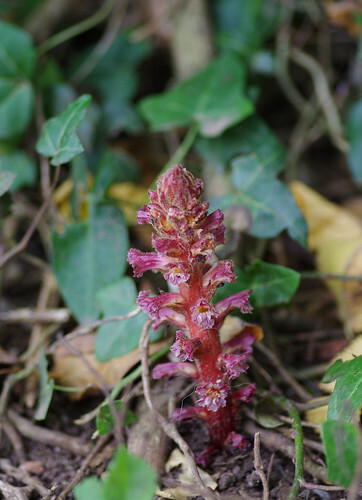 Broomrapes are unusual plants (despite them having livid flowers I cannot stop thinking of them as plants.) The roots are parasitic and the plant lives by feeding off another nearby. They also bring on another identification headache. I have read that the host plant is not always the obvious candidate (in this case, ivy) because the roots can extend to feed off something out of sight i.e behind the hedge. 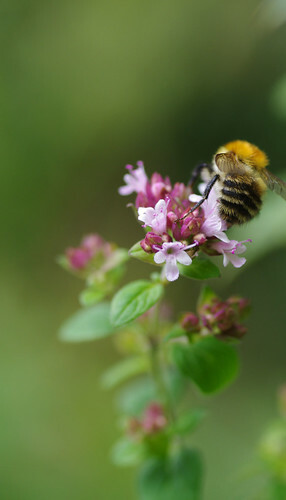 Each species of the family seems to be subject to colour variations and many members of the family have more than one potential host plant or the same host! 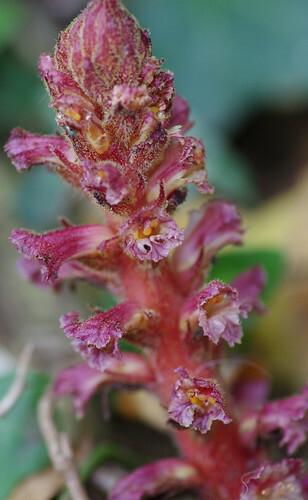 Close-up detail of another broomrape. 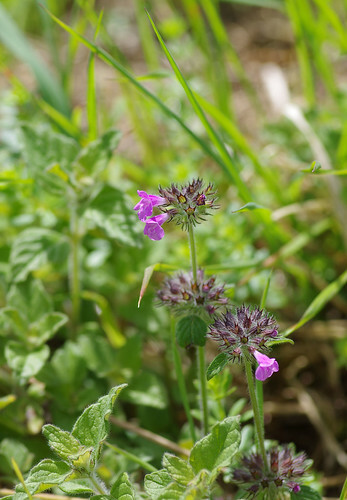 Even though we're into August, there are still plenty of wild flowers to be seen. Admittedly, some might not be at the stage of their fullest glory. Others might show fading flowers or leaves dried and crumpled by the sun. 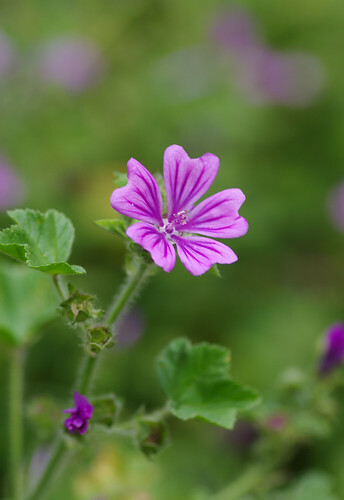 These mallows are later-flowering than many plants and given the right conditions and the right weather, they should hardily be in bloom well into September and perhaps beyond. 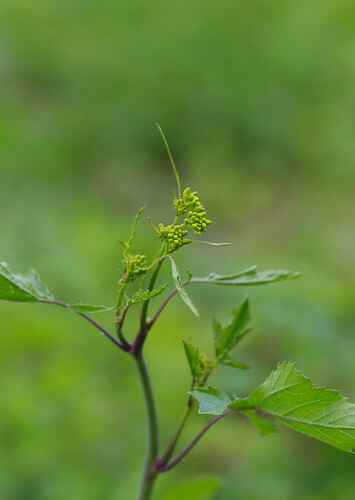 The plant is capable of growing to an impressive height on relatively bare ground. 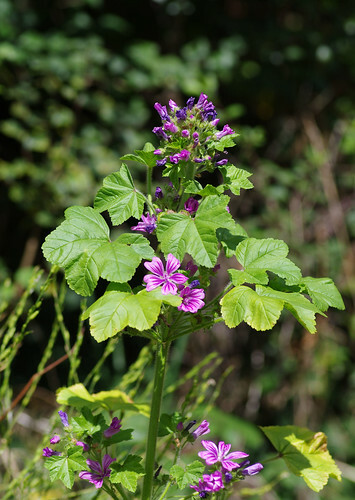 It can also be distinguished from the other mallows by the dark pink stripes within the flowers and the spread-hand shape of the leaves. We continued to the end of the path, impressed by our tally of wild flowers and turned left along the back road into Brixham, braving the onslaught of would-be Formula One drivers out for their Sunday practice-run.